As we climb from ground level our ears pop and it gets colder. The air pressure, density and temperature fall. The atmosphere's temperature is the most important property controlling its structure. The air in the first few miles of the atmosphere, the troposphere, does not significantly absorb solar radiation, instead it is warmed by contact with the ground. The surface heated air expands as it warms, becomes less dense than surrounding cooler air and rises as buoyant and turbulent bubbles. This is convection and is the main process by which the troposphere mixes and heats. Although convection stirs and mixes the troposphere, the higher it is the colder it becomes. Why? Imagine an isolated bubble of air heated by the ground and bobbing upwards. As it climbs the pressure falls and so the bubble expands to equalise its pressure with the air around it. To expand, the bubble must exert a force on the surrounding air and move it away. The work done requires energy and the only source is the internal molecular energy or heat content of the bubble's air. The internal energy decreases and the temperature, which is purely the measure of it, falls*. The bubble will rise until its temperature is the same as the surrounding air. If we visualize the atmosphere as made up entirely of such bubbles we see that they would rise and descend until a natural equilibrium state is reached where the temperature falls smoothly with increasing height**. If the air were never heated by solar radiation its temperature would continue to fall as we climb. However, at a height of ~12 km a minimum of ~-55°C is reached, the tropopause***. Above that the temperature starts to increase again because the stratospheric air contains a sunlight absorber, ozone. The tropopause minimum acts as a barrier^ between the troposphere and stratosphere because mixing and heat transport by convection can only occur when temperature decreases with height. The troposphere - with convection allowed - is turbulent and well mixed. The stratosphere with its temperature increase with height is stable, stratified into layers and relatively poorly mixed^^. * Temperature is a measure of the molecular internal energy which derives from kinetic, rotational and vibration al motion. the more energetic the motion, the higher the temperature. ** The rate of fall is known as the 'lapse rate. Its mean value is 6.5°C/km. Actual rates depend on temperature and humidity. High temperature humid air can have a rate of only 4°C/km. 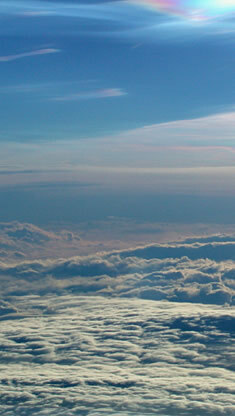 View across the tropopause from a high flying research aircraft. Below are familiar tropospheric clouds, above are rare nacreous clouds formed at the low temperatures of the tropopause and lower stratosphere. Imaged by Paul Newman of NASA Goddard Space Flight Center. Image ©Paul Newman, shown with permission.